John Micheal Nchekwube Obinna, a.k.a John Mikel Obi is a Nigerian professional footballer who played as a midfielder for English club Chelsea and still plays in the same position for the Nigeria national team – the Super Eagles. Mikel Obi was born in Jos, Nigeria as the son of Michael Obinna, who runs an inter-state transport company in Jos, the capital of Plateau State. As his father is a member of the Igbo ethnic group, “Nchekwube” means “hope” and “Obi” is a nickname for the Igbo name “Obinna” (meaning “Father´s heart”). John Mikel Obi started his official football career at the age of 12 when picked as a talented footballer from over 3,000 young talents to play in Pepsi Football Academy. A team which at that particular time was well known for going around Nigeria to search for the best there is from all the upcoming future stars, young talents to later move on to professional football. Obi stood out to all the scouts. He got picked to play in a top-flight team Plateau United also known for making stars like Celestine Babayaro, Victor Obinna, Chris Obodo and many more which moved on to playing in European teams and representing their country later on in their careers. Later known as John Obi Mikel he was gaining headlines for his country at the FIFA Under-17 World Championships held in Finland. Subsequently, he went on trial to South Africa club Ajax Cape Town, before joining Lyn in Norway. During preparations for the 2003 FIFA Under-17 World Championships, the Nigerian Football Association mistakenly submitted “Michael” as “Mikel” for the tournament in Finland. He decided to keep the new name, saying that it had a special ring to it. On 31 July 2006, he stated that he prefers to be called Mikel John Obi instead of John Obi Mikel, as he had most commonly been called. On April 29, 2005, few days after Mikel’ 18th Birthday, the Premier League club Manchester United announced that it had struck a deal with the Norwegian club Lyn Oslo to sign the player. United’s website also claimed that they had done a deal directly with the teenager and that he had signed a contract to join them. Meanwhile, Mikel’s agents were boycotted in the deal, as the club persuaded the youngster to sign a four-year contract without representation. Lyn Oslo allegedly sent a fax to his agents abroad, claiming their services were no longer required by Mikel. Reports said the deal was initially worth £4 million and would see the player arrive at Old Trafford in January 2006. Chelsea also issued a counter-claim suggesting that they already had an agreement with Mikel and his agents, but Lyn denied this claim. However, subsequent reports indicated that Chelsea claimed to have been involved in arranging the player’s original move to Europe with a view to signing him at a later date. Further substance was added to this claim after it was revealed that the player had impressed Chelsea manager José Mourinho while training with the club’s first-team squad during the summer of 2004. John Mikel Obi stated on Sky Sports News that he had been pressured into signing the contract with United without his agent present, a claims furiously rebuffed by both Manchester United and Lyn. Mikel told the British media that Chelsea was the club he genuinely wanted to sign for. In response to these events, United made an official complaint to FIFA about the behavior of both Chelsea and the player’s agents, Shittu and Rune Hauge, FIFA dismissed these claims in August 2005, stating there was insufficient evidence to bring a case against Chelsea. Mikel was charged by FIFA to stay with club Lyn Oslo as he failed to return after the Norwegian Cup game against Klemetsrud; he had not been selected for the match but had been watching from the stands. He complied with the FIFA decision and returned to the club in early September 2005 after a three-month absence. Mikel Obi joined the English Club, Chelsea after they intervened and settled the transfer saga through negotiation with Lyn and Manchester United. On June 2, 2006, Chelsea, Manchester United and Lyn reached a settlement to resolve the future of the player. Mikel’s registration was to be transferred from Lyn to Chelsea; Manchester United agreed to terminate their option agreement with Mikel. Under the terms of this agreement, Chelsea agreed to pay United £12 million, half paid upon the finalization of the contract and the other half in June 2007, and Lyn £4 million, half payable immediately and half in June 2007. As a result of this settlement, all claims in this matter were withdrawn. On 19 July 2006, Chelsea were granted a work permit for the midfielder after they completed the £16 million signing in June 2006. Mikel Obi played with Nigeria’ s under-20 football team during the 2005 FIFA World Youth Championship and won the Silver Ball as the second-best player in the tournament (behind Lionel Messi) as the Africans finished runner-up to Argentina. Mikel also made his FIFA World Cup debut during the 2014 tournament in Brazil, after the game, he was named the man of the match. The Nigerian born professional football player has an amazing football career. His track record of achievements as a footballer did not just make him famous as one of the best Midfielders, it also added some digits to his account. John Mikel Obi has a net worth of $57 million with an annual salary of about $6 million which is a little below some of the richest African footballers like Samuel Eto’o and Yaya Toure. However, he still stands as one of the most decorated and richest footballers in Nigeria. Mikel left Chelsea in 2017 after signing to Chinese club Tianjin TEDA on a free transfer on January 6, 2017. Following his transfer, Mikel is meant to earn about $185, 611 as his weekly salary and an annual take-home salary of $8.6 million with bonuses and add-ons. In addition to his earnings from his football career, John Mikel Obi also earns a lot from endorsements. He is a brand ambassador for some top brands in Nigeria and abroad. For example, he was a brand ambassador for Amstel Malta where he earned about N800 million alongside the Nollywood star actress Genevieve Nnaji. Prior to that, he was a brand ambassador for Peak – one of Nigeria’s giant milk brand. The deal was worth N20 million and it lasted for two years. Mikel’s house in the United Kingdom is worth over $265,000. He also has a collection of cars including Bentley Continental GT, Mercedes G Wagon, Range Rover Sport, and Black Mercedes G 500. 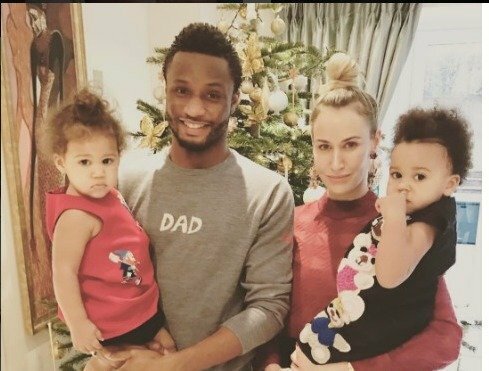 John Mikel Obi is a father of two children – twin daughters, with his Russian girlfriend Olga Diyachenka. Mikel has been with Olga since 2013 and they welcomed their first set of twin girls in 2015. Olga, while revealing how she met with Mikel, shared on the Instagram page that Mikel used to be her parent’s neighbor for five years and that their relationship started when she went to drop off their flat keys in Mikel’s flat. She said they began as just friends before developing to lovers. Mikel Obi’s twins neither have an Igbo or Russian name because according to Olga, they are citizens of the world.